One of the most popular reasons for people to move to Florida is the weather. Besides our beautiful beaches and diverse culture, the Jacksonville area enjoys a tropical climate almost year round, with very moderate winters. While this means that you can go all year without scooping a single shovelful of snow or salting one foot of sidewalk, it doesn’t mean that you can simply ignore your landscaping in the winter. With both residential and commercial customers throughout the Jacksonville area, C & L Landscape has helped many people come up with landscaping ideas that will give them a beautiful lawn 365 days a year. If you’d like to make some changes to your residential landscaping that will bring color and texture to your lawn all year, please contact us for a variety of professional ideas. If you’re happy with your current landscaping but want to keep it looking beautiful all year long, keep reading for some winter tips from our experts! Yes, Your Landscaping Can Suffer Winter Damage, Even In Florida! Pruning – The cooler temperatures associated with winter create the perfect situation for pruning of trees and larger shrubbery. This process of selectively removing unnecessary branches prevents your yard from looking overgrown in the winter and reduces the risk of breakage during windy or rainy weather. Mulching – Mulching around trees, shrubs, and flower beds will help your soil retain moisture during the drier winter months. Mulching also discourages weeds, reduces soil erosion, and helps to keep roots warm during the colder weather. Continued Irrigation – In colder parts of the country, snow and ice accumulation prevent landscaping from being watered during winter, but that’s not the case here in Florida. It’s important that you continue to water plants, trees, and shrubs during this time, especially if they were recently planted. Preparation – If you plan on decorating your yard for the holidays, it’s essential that you exercise caution when running extension cords or setting up generators. Always make sure the area where cords will lie is free from flammable debris. And if you’ve hired a professional residential landscaping company to take care of your yard, they should be alerted to all cords and power sources for safety. Protection – In the event that there’s a freeze warning in the Jacksonville area, it’s essential that you take proactive steps to protect your landscaping. This means covering vulnerable plants with cloth, sheets, quilts or burlap to prevent frost. Never use plastic for covering plants, as it will retain moisture and burn the plants. 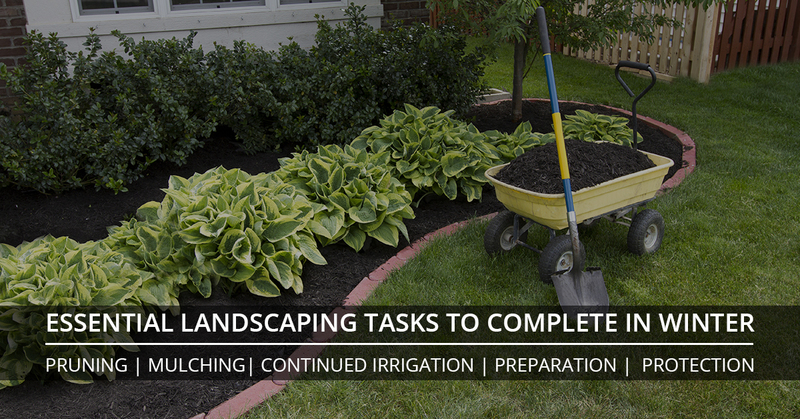 Want help planning or maintaining your residential landscaping? Contact C & L for creative ideas that are unique to Florida’s growing season.